Inca Indians in Peru were the first to cultivate potatoes circa 200 BC. Today, potatoes are North America’s most popular vegetable and are the number one vegetable crop in the world. Potatoes belong to the nightshade family whose other members include tomatoes, eggplants, peppers, and tomatillos. These versatile spuds can be boiled, baked, fried, steamed, mashed, pureed or roasted with or without their peels. They’re often paired with butter, sour cream, or oil, but left on their own they’re quite low in calories and loaded with nutrients. 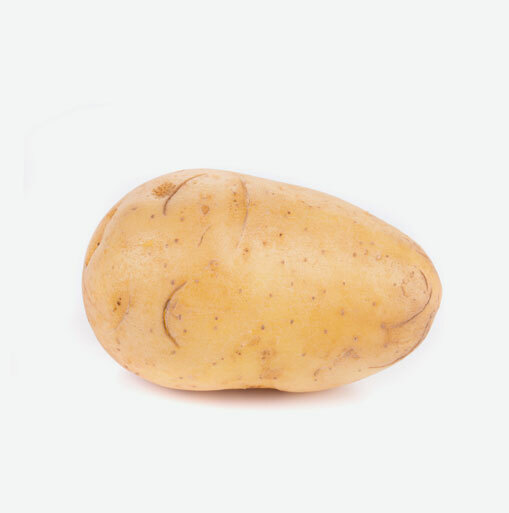 Potatoes can have 600-800 mg of potassium which is about 40 percent more than a banana.. One six-ounce potato also contains three grams of highly digestible protein, almost as much as half a glass of milk, giving it the potential of being a meal in itself. Look for potatoes that are free of dark or soft spots and mold. Choose firm, heavy potatoes that have healthy skins. Store spuds in a cool, dry place in a burlap or paper bag but not in a refrigerator because their starch content will turn to sugar giving them an undesirable taste. In addition, do not store potatoes near onions, as the gases that are emitted by both veggies will cause spoiling of one another. Mature potatoes can keep up to two months but new potatoes are more perishable and will only keep for one week. Serve up potatoes in salads, soups, and stews. Mash your spuds, roast them, bake them and steam them. Try the different varieties of potatoes and enjoy their flavour and most of all their nutrition. Baby potatoes/New potatoes are also known as creamers, potato nuggets or earlies. New potatoes have flimsy, parchment-like skins that you can peel off with your fingers and have a high moisture content and creamy texture. They can be cooked whole and are delicious steamed or roasted. Purple potatoes are also known as Peruvian potatoes, blue potatoes or black potatoes. These purple-fleshed potatoes have a medium starch content, so they’re good all-purpose potatoes. They make an interesting and colourful addition as mashed potatoes or cubed into potato salads but tend to get mushy if over-cooked. Red-skinned potatoes are also known as Red potatoes or Red Round potatoes. These waxy potatoes hold their shape after they’re cooked, so they’re great for making potato salads and scalloped potatoes. Don’t mash red potatoes or you’ll end up with a sticky, gooey mess. Russet potatoes are also known as the Idaho potato, baking potato, starchy potato or chef’s potato. These potatoes are high in starch and low in moisture, so they bake well and yield light, fluffy mashed potatoes but don’t hold their shape after cooking, so don’t use them to make potato salads or scalloped potatoes. Don’t wrap them in aluminum foil while baking them because the foil traps moisture and makes the potato mushier. Yukon Gold potatoes are good all-purpose potatoes that have yellow flesh and a rich flavour. They’re great for boiling, but they tend to fall apart if over-cooked. Fingerling potatoes are also known as Finger potatoes. There are many varieties of these small, finger-shaped potatoes, but they all tend to be low in starch, and they are great for roasting or making potato salads.